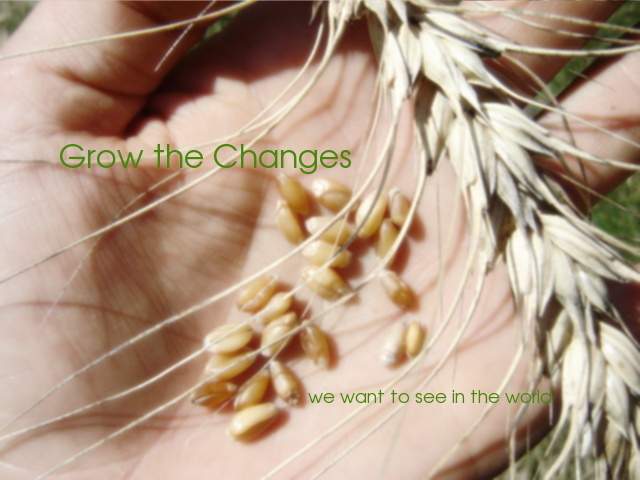 One of the goals we set for ourselves in 2008 was to grow grains. Growing our feed grains was a priority, to cut our expenses in producing eggs, dairy and meat. Every time we cut out a major expense, it allows us to use the money we would have spent on purchasing grain, to invest in a tool, like a bicycle generator, that will again, allow us to cut out another expense, like gas for the generator. This is the way that we gradually step down our dependence on "making" enough money to buy the things we need. This approach to "earning a living" is what keeps us both at home. With most of the jobs we do at home, we are able to "pay" each of us $20 an hour, when we compare what we produce, with the cost of buying it, and transporting it home. We pay close attention to the time we spend on jobs, like harvesting grain, and if it is taking too long so that our "wage" drops below $10/hour, then we make changes, and experiment with different techniques and tools to improve our efficiency and bring our "wage" back to a "living wage". This wage analysis is a part of how we prioritize our goals each year. Our health is the true measuring stick, if we need to make a change to improve our health, lower stress levels, or improve the quality of our food (including improving the health of livestock and soil), then it becomes a priority goal for the coming year. Second to our health, we tackle our largest expenses. For 2008 it was feed grains, along with some of our house grains. For 2009 we will continue to improve our feed grains, by growing millet and peas for the chickens and the goats, and we will focus on growing more of our house grains. No one can do everything, all at one time, but we can learn to do a lot more than we think we are capable of, by taking on one thing at a time. This builds skills, confidence and experience so that each year we can take on more. Growing all of our house grains is a pretty big goal, and we were not sure exactly how the harvesting and threshing would work out, so we prioritized growing wheat kernels for 2008, and experimenting with our techniques and tools. Now that we have gained skills, tools, experience and, not the least important, confidence, in small scale grain production, we can add more grains to the list, like hulless oats, quinoa, chickpeas, lentils, etc. 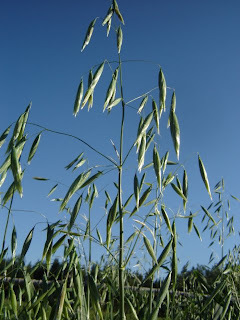 Anticipating this two or three year plan toward growing our grains, in the spring of 2008, we purchased packets of seed to plant experimental and/or seed crops of hulless oats, quinoa, millet, amaranth, and chickpeas. With these experimental plots we could work out the needs of each crop in our climate: growing conditions, nutrient levels, spacing, types of pests, planting and harvesting dates, harvesting and threshing techniques, and expected yields. This way we do not make a large investment in the first year, risking a failed crop due to lack of knowledge, or a crop we cannot harvest for lack of time or tools. This summer I was able to record the length of maturity and frost hardiness of each of our experimental crops so that next spring I know planting dates, I recorded yields so that we know how much to plant, and we experimented with threshing techniques so that we can plan ahead if we need any tools. This spring we planted a 3' x3' plot of hulless oats. Compared to the feed/hulled oats we grew for the animals, they had similar requirements. The thing we wanted to know is how easy they are to thresh, and which technique would work best. When the grains were fully ripe, I simply stripped the seed heads into a bucket to harvest this small plot, but we could also harvest a kitchen plot, about 30' x 100' with a hand sickle in an afternoon. We have found that harvesting the heads, instead of cutting the stalks, makes it easier to thresh, although it takes longer to harvest. But if weather forces us to take the crop off in a hurry, we can do so with the sickle or scythe, and spend the time we would have spent harvesting, threshing the grain instead. We have been threshing our wheat with this meat grinder with great success. The design of the latest harvesters use the same principle of a turning screw to thresh the grain. We have made one improvement to the hand-cranked grinder, by attaching the drill to drive the auger. It makes the job a bit smoother. Why not a motor? A motor uses more power, and it is running the entire time, like brushing your teeth with the water running. With the drill (which by the way is also the way we "motorized" my hand crank butter churn), Mr. Fritillary has more control. We will be building a removable hopper as another improvement. Oats are a softer grain than wheat, so we wondered if the meat grinder would chop too many of the oat groats (or seeds). We tried it without the blades, but it left much of the oats unthreshed. So we put the blades back in, and ran the oats through, not a one was chopped, and all of the heads were threshed. So here you can see the oats in their hulls, the groats threshed and winnowed, and finally, the rolled oats. I enjoyed your post on the hull-less oats. I planted mine this fall and they are over-wintering right now. I don't know if that's an option for the colder areas up where you are...probably not. I'm trying my hand at some winter wheat as well. It's nice to see some green out there when everything else if turning brown. My goal is to have a loaf of bread that I personally grew. Hopefully I'll be able to report that this coming summer. I'd love to hear more about how you are learning the "old" farming skills...like how do you know when to harvest the wheat...how do you store it, and how DO you separate the bran from the endosperm to make a lighter loaf (like my wife likes)? Right now I add some white flour to the whole wheat. You're off on an amazing adventure. I know I'm totally not ready to do the same...I'm just dabbling around the edges. redclay, oats do not winter up here in the frozen wastes. We did try a winter wheat and fall rye last year. The winter wheat did not winter very well, we ended up re-sowing the crop to Spring wheat. The fall rye wintered just fine, it is the hardiest of the grains. Good luck with your homegrown bread. It is a celebration in itself. We don't rely much on learning "old" farming skills. Mr. Fritillary has some agricultural experience, so he knows how to farm the modern way. And I just wanted to grow our food, but had no experience. So we have sometimes come up with our own way. Sometimes modern techniques are improvements over older ways, like the seed drill improves the broadcasting method. Sometimes older techniques are simply the right scale, like scything. Getting a harvester for two acres of grain is silly. We do not idealize older technologies out of nostalgia, we use the technology that helps us get the job done best. When to harvest wheat can be an art to learn. We go out and taste the grain every day as it is getting ripe. The percentage of moisture is very important for modern harvesters because the heads need to be dry enough to shatter, and the grain needs to be dry enough not to start heating up when it packed tightly together. We found with scything the grain, or picking the heads, it was more forgiving when it was harvested, because it could finish curing in storage, before being threshed. For example you commented on the bean post, how you picked your beans still green off the vines, and dried them inside before shelling them. If your wheat is very nearly ripe, and there is a big rainstorm coming, you could pick the crop into feed bags for example, let it finsish curing, then thresh it for long term storage. I will be writing more about small scale grain growing and harvesting. But you might like to do some research on your own about grains, and how to tell when they are ripe. For a light bread, you do need to sift out the bran, which does result in a nice light flour. But the bran is about 40% by weight, so you would have to grind nearly twice what you need, and come up with a good way to use all that bran because the bran contains all of the nutrition. We like the heartier loafs. Thank you for making this post. I am intensely interested in growing all manner of grains in the coming seasons and hull less oats are high on the list, I have about four lbs of seed to plant and hope they work out well. Of course wheat, millet, spelt and some others will be planted as well. Reading your blog and seeing your methods of cleaning gives me hope for this project. We hope to produce enough to feed a flock of chickens and to also be able to feed a family of four for most of a year. Thanks and keep up the good work friend! Bishops Homegrown, good luck to you! If you haven't already, take a look at my winter feeds blog earlier this month. The chickens do really well being fed shocks of grain, if you have the space to store the grain this way. I look forward to reading about your grain growing adventure. I planted a small plot of hulless oats this year and tried running the seed heads through a meat grinder, but perhaps my meat grinder is not the right kind because the seed heads come through unthreshed if the plate with the holes is off and very little comes through if the plates with the holes is on. Any suggestions? I obviously don't know what I'm doing, really. I'll likely try making a screen with hardware cloth next. Elizabeth, Sorry I didn't get back to your question right away. I have a few ideas. The one part of the meat grinder/ thresher we did not show a picture of is the plate. Ours came with two plates, one small and one large holes. We use the plate with the large holes, about 1/2 or 3/8 inch diameter holes. So if you only have a plate with fine holes, then your idea of hardware cloth will probably work. The other thing that would cause poor threshing is the moisture content of the crop. The oats will be difficult to thresh out if they are too moist, anything over 12% moisture. The best way to tell if they are ready to thresh is to rub a few heads between the palms of your hands, and if the oat kernels come out easily, then it is dry enough. If they are slightly damp, just bring them inside, either in half-full burlap bags or pillow cases (or something to that effect), and hang them in a dry, airy place. Keep checking them and turning them in the sacks until they thresh out easily in your palms. We grew a 6 x 6' plot of hulless oats which I need to thresh. I like your idea of the meat grinder, but I'm not exactly sure how it would actually separate the oat kernel from the leafy hull? If the kernals are forced out the holed plate of the grinder, what happens to the husks? Did you try "flailing" the grain, i.e. beating it with sticks? Drumstick, in the case of the meat-grinder, the oat kernel is separated by the action of rubbing between the blades of the grinder and the large holed screen. Because of the space between the blades and screen, as well as the size of the holes, very few kernels are actually cut by the blades. Using the same principals, one could easily design a larger small-scale thresher. The threshing process is intended to break the kernels out of their husks, but it does not actually separate the two, both the grain and the chaff (hulls, stalks and other plant matter) come out of the thresher together. Threshing is followed by winnowing, to separate the light-weight hulls from the heavy kernels. We use a small desk fan, and the action of pouring the grain and chaff from one bowl/bucket to another in front of the fan, a few times until the grain is clean. If you live in a particularly windy area, you can use the wind instead of a fan, either pouring between containers, or using a sheet or tarp to throw the grain up, allowing the wind to carry the light chaff away (this would take two people, of course). We have found that flailing the grain takes a lot longer, and with less consistent results, but some people do prefer to flail, or beat, a shock of grain against the side of, perhaps, a clean plastic garbage can until the kernels are loosened from the heads, falling to the bottom of the container. Flailing would also be followed by winnowing, to clean out any remaining hulls. Hi, we tried the meat grinder and with mixed results. Our newly acquired one doesn't have holes but pear shaped openings, one plate only. We got it at a used store. Testing the husks according to your suggestion they are still too moist, given we live on a peninsula between waters lots of moist air. We have them in a yoga studio in front of a pellet stove for more drying. So, is our hand grinder usable? with the pear shaped holes? Thanks for all your efforts for all of us. Anon, I couldn't say for sure, we've only ever used the one meat grinder. But theoritically, the oats are threshed by the internal rubbing action of the screw against the sides of the body. The exit holes don't have that much to do with it, only speeding or slowing the flow of the grains. The shape of the holes shouldn't matter. What will matter more is the size. If they are too small then the oats will flow slowly and get chopped by the blades. If the holes are too large then some of the un-hulled grains may flow through too fast. You'll just have to give it a try. If they get a bit chopped it's not such a big deal, they can still be winnowed and used. If it flows too fast, you may have to pass it through twice, or pick out some of the hulled grains by hand. Either way, the drier the oats are, the better it will work. Make sure that the inside of the meat grinder is fully dry as well. Very useful website you have here. 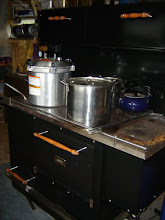 I grew some Baton hulless Oats (in Nova Scotia) this summer and used an old meat grinder to thresh them as you suggest. It worked well except that it cut more of the grains in half than it left whole. Larkin, there's a million ways to thresh out kernels, so keep looking around for ideas and you'll be sure to find something that works for you. caper66, I figured that different meat grinders would give different results, afterall they are not designed for the job. We have found that it is mostly the result of the size of the holes in the plate that determine wheter the kernels get sliced or not. We have a plate with 1/2" holes and one with 1/8" holes, and ended up making a plate with 1/4" holes out of sheet metal. It is a better size for some jobs. You may want to make a plate with larger holes than the one you have. Global Voices: The world is talking. Are you listening? We believe that growing our own food is the most radical and effective way to promote social justice, equality and sustainability. Everyone, to some extent, can grow their own food. It makes even more sense for communities to grow their own food, sharing responsibilities and costs. It requires a restructuring of values, the kinds of values that are necessary for a consumer culture to wake up to the exploitation and poverty we perpetuate throughout the world. Our socially and environmentally exploitive food-culture perpetuates the very resource wars and poverty that concern so many of us. Growing food brings our environment sharply into focus; we learn how much we rely on healthy food, healthy soil and an healthy ecosystem. On our homestead, and in this blog, we practice and advocate human-scaled food systems, with an intimate hands on approach, as a way for everyone on this earth to be nutritiously and sustainably fed, from the first world to the third world. Our diverse, closed-loop homestead is to us, a relevant form of protest, as well as a constructive way to build a sustainable future. We are all in this together. Not one of us lives on this earth alone. Just in case you are curious about the way we live... We produce enough income from a half-acre market garden to live a simple, debt-free lifestyle. We are off-grid and produce our power from an 80 Watt solar panel to run the things we need. We hydro-cool our perishables, and can, dry or cellar our food instead of running a fridge or freezer. We cook and heat water with wood, year-round, which means getting a fire going each morning, even in the heat of our two week long summer, and doing all the cooking and washing before the heat of the day. We ride bicycles to get where we need to go, especially to the Community Internet Access Center, and barter for rides into town for shopping a few times a year. In our Northern garden, Zone 4, we produce and preserve our own vegetables, herbs and most of our grains in a half-acre garden and acre grain field. We keep a small herd of goats, and a small flock of hens, to produce our meat, dairy products and eggs. We live seasonally, our daily life in the spring centers on planting and cultivating, our daily life in summer centers on harvesting and preserving, our daily life in fall centers on preparing for winter, and our daily life in winter centers on reading, learning, writing, philosophizing, planning and crafting. We are always looking for ways to innovate the tools and techniques for growing food on a home-scale. And we are always looking for ways to strengthen the effect of our lifestyle choices by connecting what we do with the larger community. 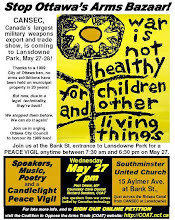 Grow the Change is licensed under a Creative Commons Attribution-Share Alike 2.5 Canada License.